Westchester County does not discriminate against qualified individuals with disabilities on the basis of disability in its services, programs or activities. 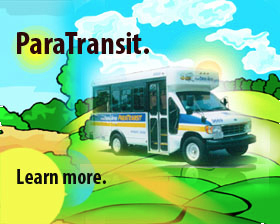 Read the county's policy on Fixed Route Accessible Transit Services. To file a grievance, contact Evan Latainer, Westchester County ADA Coordinator, at (914) 995-2958 or e-mail . You may download and print the Notice and Grievance Procedure. Visit the United States Department of Justice Web site for more information and technical assistance on the Americans with Disabilities Act.